Arista Networks is the leader in building scalable high-performance and ultra-low-latency networks for today’s data center and cloud computing environments. Purpose-built hardware, and Arista EOS, the world’s most advanced network operating system, provide single-binary system images across all platforms, maximum system uptime, stateful fault repair, Zero Touch Provisioning, Latency Analysis and a fully accessible Linux Shell. Arista Ethernet switches are the perfect network solution for your most demanding workloads.With native support for VMware Virtualization and hundreds of Linux applications integrated into hardware platforms designed to meet the stringent power and cooling requirements of today’s most demanding data centers, Arista delivers the most efficient and best performing 10Gb Ethernet platforms. 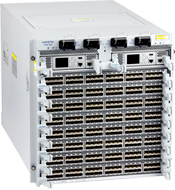 The Arista 7500R Series is a revolutionary family of high density Spine platforms with programmable support for over a million routes, unprecedented 100GbE density and large table sizes with investment protection. 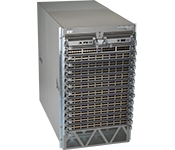 The Arista 7500 is an ideal platform for high performance data center networks and universal spines with internet scale routing scalability. The Arista 7500 Series of modular switches sets a new standard for performance, density, reliability, and power efficiency for data center switches. 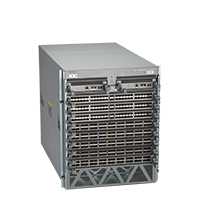 In compact 7 RU (4-slot) and 11RU (8-slot) chassis options, the Arista 7500 is an ideal platform for building low latency, high performance data center networks. The Arista 7300X and 7320X Series of modular switches delivers the highest 10/40/100GbE capacity and power efficiency. 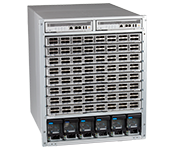 In purpose built 4, 8 and 16 slot chassis options the Arista 7300 Series are ideal for building leaf / spine and Spline™ data center networks. The Arista 7280R Series provides a combination of dynamic and deep buffers, high performance and full internet scale routing in a high density and flexible fixed configuration switch router combined with extensive features such as VXLAN and LANZ. 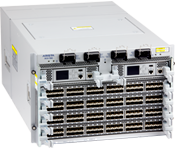 The 7280R are built for next generation IP storage networks, content delivery networks, and internet peering or lossless two-tier designs, equally suited to a Universal spine or leaf role. The Arista 7280E Series provides a combination of deep buffers with 10/40/100GbE in a Top of Rack switch combined with extensive features such as VXLAN and LANZ. 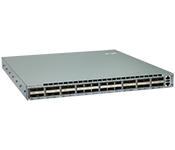 The 7280E are built for storage networks, content delivery networks, and lossless spline/leaf datacenter designs. The Arista 7160 series are purpose-built 10/25GbE and 100GbE data center switches with wirespeed layer 2 and layer 3 features. They combine an adaptable L2 and L3 forwarding engine with a highly programmable and customizable switch architecture that supports multiple overlay technologies and advanced encapsulations. 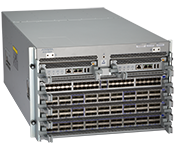 The Arista 7100 Series features the industry’s highest density and lowest latency 10 Gigabit Ethernet switching solution and the first with an extensible modular network operating system. With breakthrough price-performance, the Arista 7100 Series enables 10 Gigabit Ethernet to be deployed everywhere in the data center, which can significantly improve server utilization and consequently data center power efficiency. The Arista 7060X and 7260X Series are purpose built high performance, high density, fixed configuration, data center switches with wire speed layer 2 and layer 3 features, combined with advanced features for software defined cloud networking and emerging requirements. Delivering a choice of interface speed and density allows customers to seamlessly evolve from existing 10GbE and 40GbE to 25GbE and 100GbE. 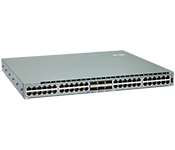 The Arista 7050X and 7250QX Series are a range of 1RU and 2RU 10GbE and 40GbE wire speed multilayer switches powered by Arista EOS, the worlds most advanced network operating system. The 7200 and 7050 X Series are purpose built to address the growth of big data, IP Storage applications, expansion of web and cloud data centers and dense virtualized multi-tenancy environments. 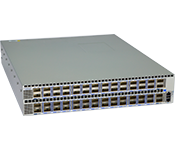 The Arista 7010T 1GbE switch offers unmatched performance for high density data center deployments. With 48 100/1000BASE-T and four integrated 1/10GbE SFP+ ports offer non-blocking designs with 40Gbps of uplink bandwidth. The 7010T delivers a power efficient solution in a compact footprint with scalable forwarding tables.